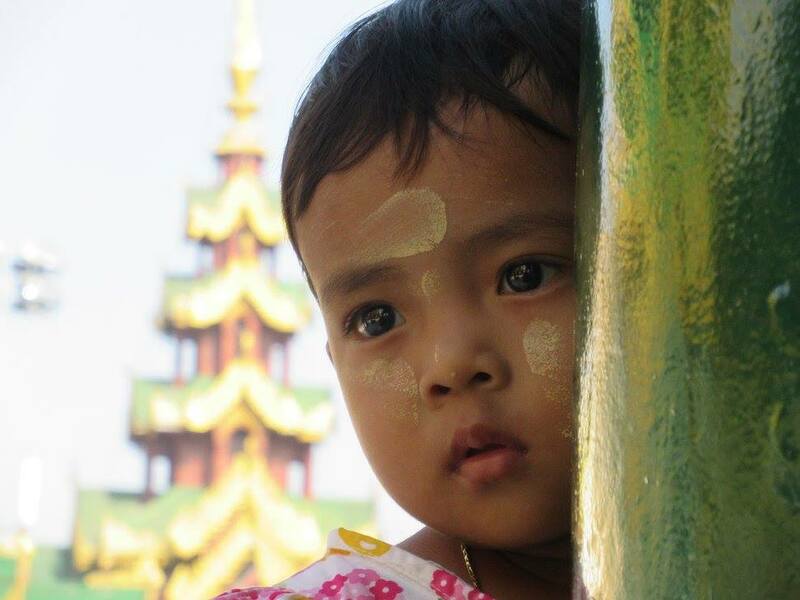 Visit Myanmar in 2 weeks – Always Look Back ! 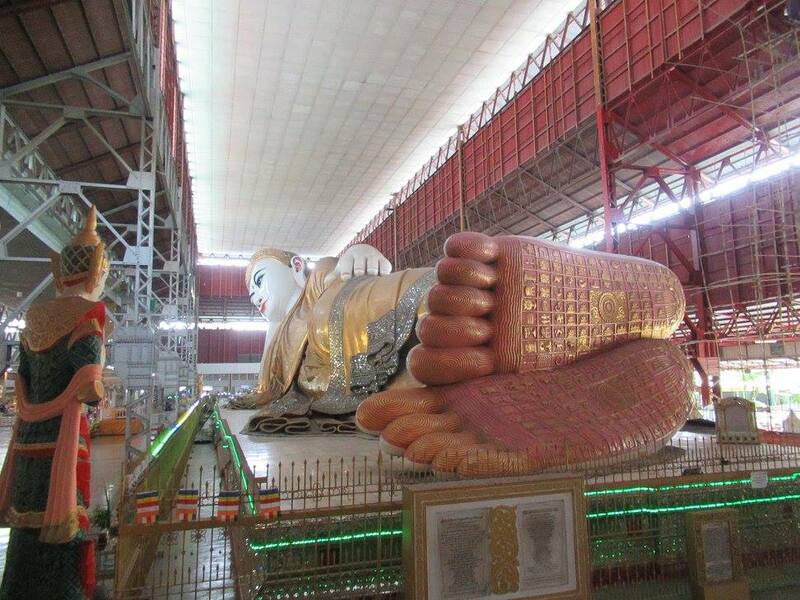 Myanmar is a country where you can find everything! Nice landscapes, old ruins, buddhist temples, trekkings, good and cheap food and drinks, and a lot of people talking english (locals but also many tourists). I felt everything was simple, and I enjoyed good times with great people from everywhere! I only regret that the tourism seems to kill a little bit the authenticity of some places. 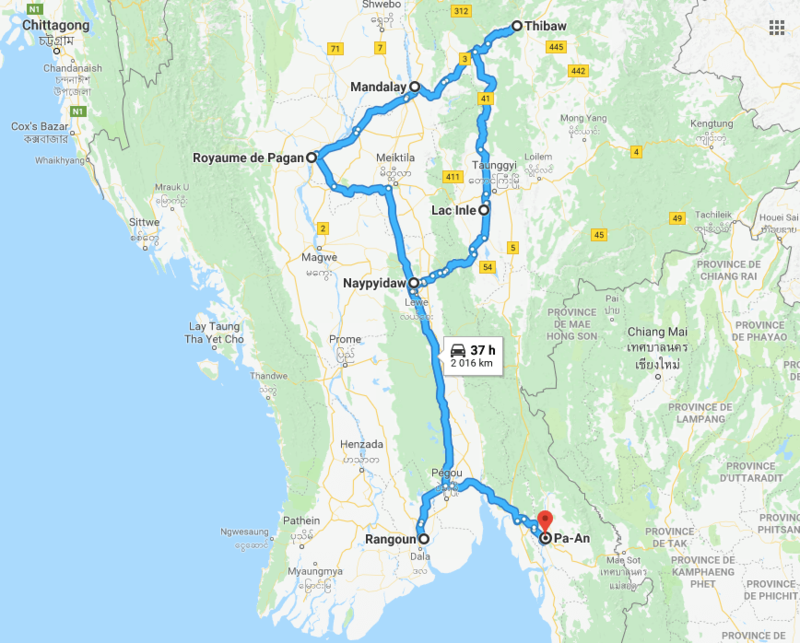 In two weeks I only had time to focus on the main sightseeings: Yangon and its temple and street 19th, Bagan and its fields of ruines, Mandalay and its famous U Bein bridge, Hsipaw and the Shan community, before going south to Inle Lake and Hpa An. I arrived in Yangon after India and Bangladesh and I felt I was back to life! People don’t stare at you, you can drink and smoke everywhere, and find backpackers hostels in every main town. Yangon is a big city full of people but very quiet in comparision to other asian cities where I’ve been. I found an hotel (Four Rivers, 10800 Kyats the night in a dorm with breakfast) street 19th where food and drinks are very cheap, and the day after I was so hangovered I just walked around the south of the city (not a lot to see but I love the ambiance of the streets with the mini tables and chairs where people take a tea, meat sticks or a soup). The day after I was fresh and new and I walked during hours around the city with Beno, a german I met street 19th. We visited the Shwedago Pagode, main one expensive but really gorgeous (first I saw in Myanmar, I was impressed but there are many more everywhere), Nga Htat Gyi Buddha Temple and the big lying Buddha (Chauk Htat Gyi) before going to the Bogyoke market. After this I had a bus in the night to go to Bagan (the bus was at 8pm but I had to leave the city center at 4.30 to avoid the trafic). Bagan is a huge region full of temples EVERYWHERE! We arrived around 5am, right on time to go to see the sunrise. I met in the bus two mexicans, Juan Carlos and his mother Maria, so we shared a taxi for 30.000 to go to a temple full of tourists to see the sunrise and then to find a hotel. Sadly it was cloudy and we haven’t seen much of the sunrise, neither the famous globes… So we went to New Bagan and we found a 3 beds private room for 36$usd. This day was raining so I just went in a spa to relax, and the day after it was raining again so I just went to walk close by the city, visiting some temples around the center (Ashe Peitek and Sitanagyi pagodas). The third and last day we finally decided to rent a scooter to go to see the sunrise in Low Ka Oushang before starting a round trip to the main sites. How many days to visit Bagan? If you’re not so unlucky with the weather as I’ve been, you MUST see the sunrise trying to find a nice unknown point because everybody do the same. Then you have all day to easily visit the main sightseeings. I would recommend you to stay at least a couple of days to enjoy the sunrise and main temples, but it’s also a nice place to stay more time, enjoy the area more deeply, go to Popa mountain, or lost yourself in the west, territory of local communities! After this nice last day in Bagan, I took a local bus to Mandalay at 4pm and arrived by night. 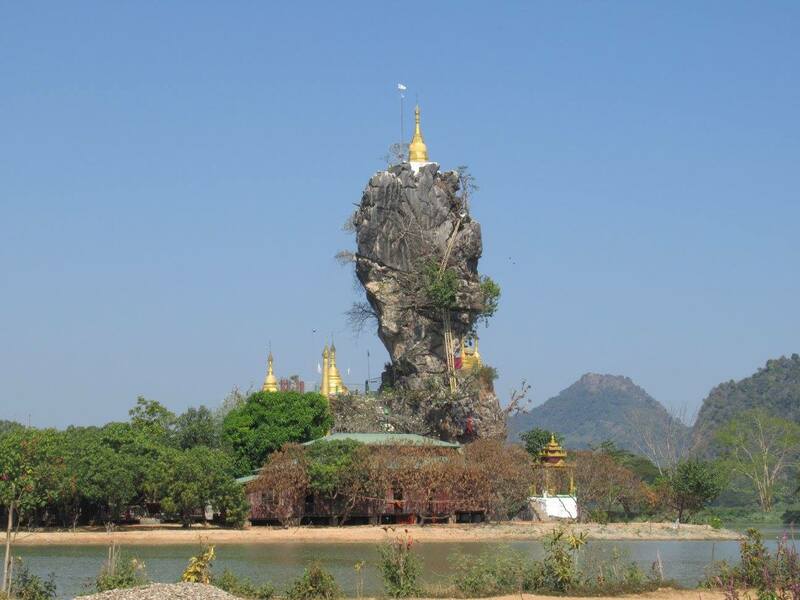 I just had one day to visit this huge city, so I first took a moto taxi to lead me to the Yankintaung Hill (very high, lot of stairs, really worth it, I think the best time to go there is for the sunset) where they ask you once on the top to pay 1000 Kyats, and then close by to Kuthodaw Pagoda. 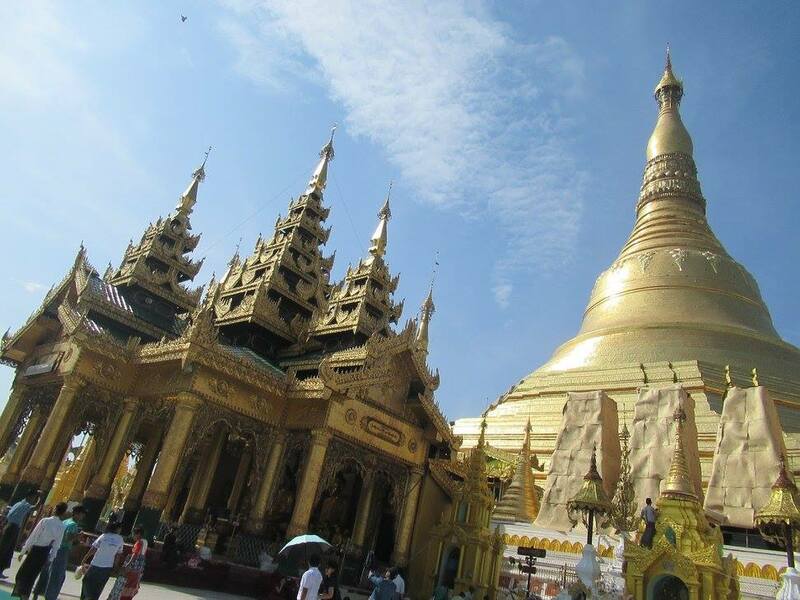 I wanted to go to Shwenandaw Kyaung but they told me you had to pay 10.000 Kyats so I prefered to go directly to Mahamuni Pagoda (I first paid 5000 Kyats to go to the north side of the city, but only 500 to go to Mahamuni… Just negociate!) 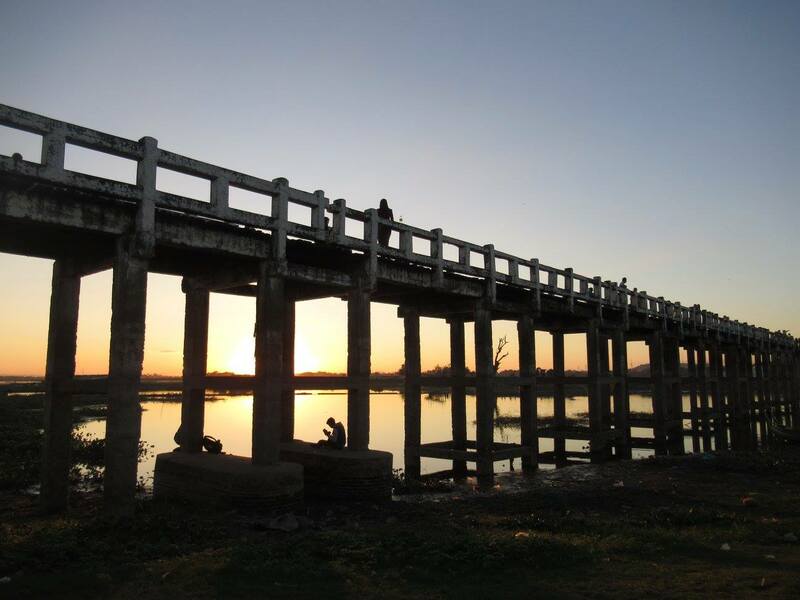 I decided not to visit the Palace, as a lot of tourist told me it didn’t worth the entrance fee… From Mahamuni I took a bus who left me at 1km from the famous U Bein bridge. This biggest teakwood bridge is really nice, but the amount of tourists for the sunset really kills the magic of the moment. 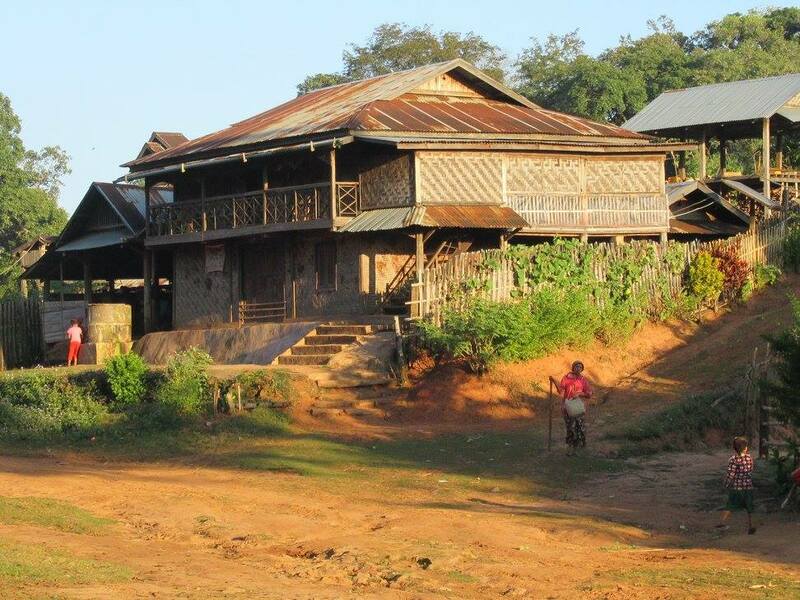 Then I went to Hsipaw to find a trekking inside of the lands and visit Shan villages. It was a long trip by van (8am-2pm), and when I arrived I just found a two days trekking starting the day after (depends if they have enough people). The trek was very nice but nothing really special. We ended after a small walk of 6 hours through the rices plantations and mountains in a small village where we had a traditional music show and dance by night, with the famous “demon”: a dragon made with two people eating the money you left on a plate. The second day we kept walking passing really nice landscapes, and finished our trek to a nice waterfall before coming back to the city by taxi. I took the bus at 4pm (the last one) to Inle Lake and arrived by the morning (around 7am) after paying 13.500 Kyats the zone entrance fee. You have there plenty of boats going to the lake with a kind of touristic road passing through a lot of shops showing you how people make their silver jewels, lotus clothes, umbrellas, visit Hpaung Daw U Pagoda (I didn’t pay the entrance as I visited before many pagodas before) and a Monastery. My guide was alone with me, and as I didn’t pass a lot of time in the shops, just had a quick lunch (only accepting to pay a coffee 3 time the normal price) and refused to pay for the entrance of the Pagoda, he lead me to his family house where I took tea watching TV with his mom and aunt during an hour. When we arrived to Phaung Daw Oo Monastery, last stop before the sunset, he told me we had to wait 2 hours there! It’s nice but not as big, so I asked him to go in an other place, and he accepted to go to the Small U Bein bridge where I found “normal” restaurants and had lunch at 3pm. We finished the day by a nice sunset with a fisher my guide called to do his nice figures for some Kyats. The day after I met a french guy and we went together to a great vineyards where they do degustation. 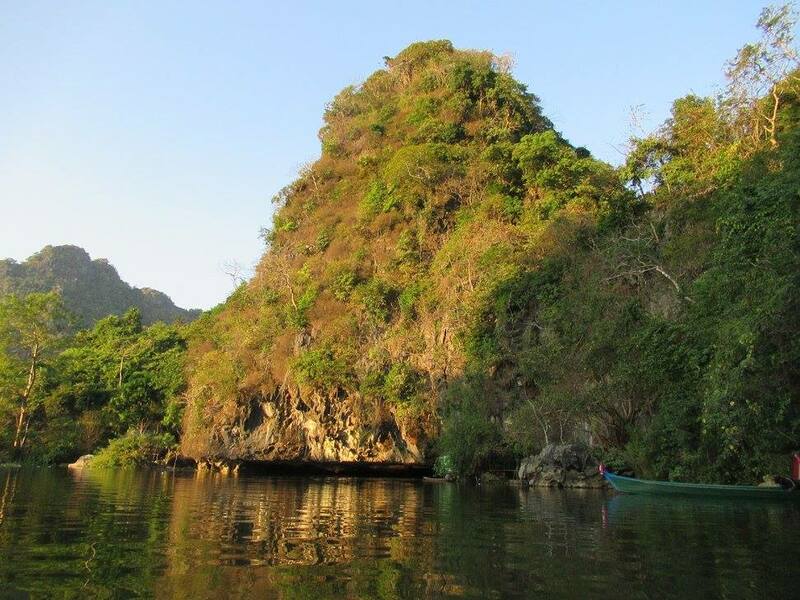 At the end of the day I had my night bus to Hpa An. You can also do the 3 days trekking starting from Kalaw, I would have done that if I didn’t came back from mine in Hsipaw! From Inle Lake it took around 9 hours. We arrived right on time for the checking in a hotel found by two frenchies I met on the way. We took a nice breakfast and rented a scooter to visit the sites around. The first day we rented it for a half day. 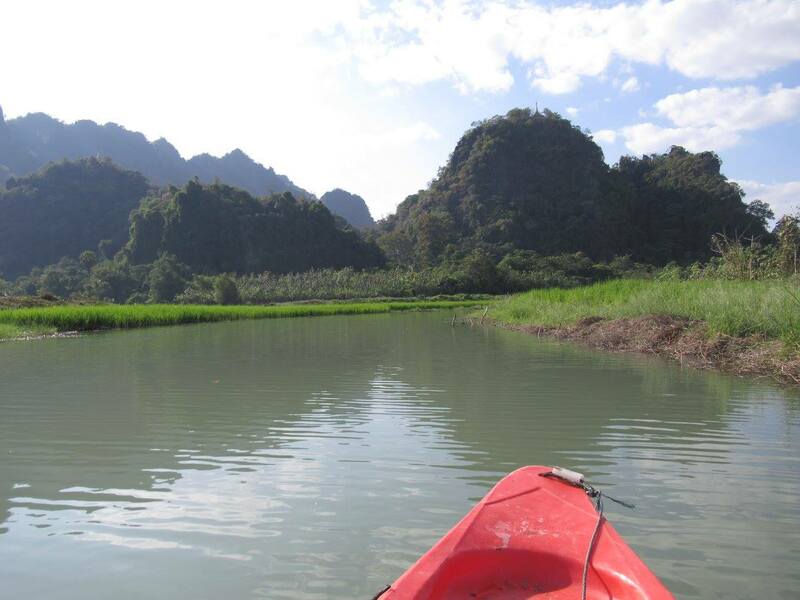 We went on the east part to Kaw Ka Taung cave and the nice baths and restaurant area where we rented a Kayak for a tour in the rice plantations (nice but small) and we finished the day at Dayan cave where you take a boat for the way back. The second day direction south to climb the mount Zwegabin and his temple. But when we arrived at 11am, saw the mountain, and heard it was 1h30 to go and 1h to go back we abandoned the idea… I think the best way to go there without the hot is in the morning, starting to climb the stairs at 3.30am! I truly prefered to pass the day with my two friends than climbing there but if you can do it go for it! 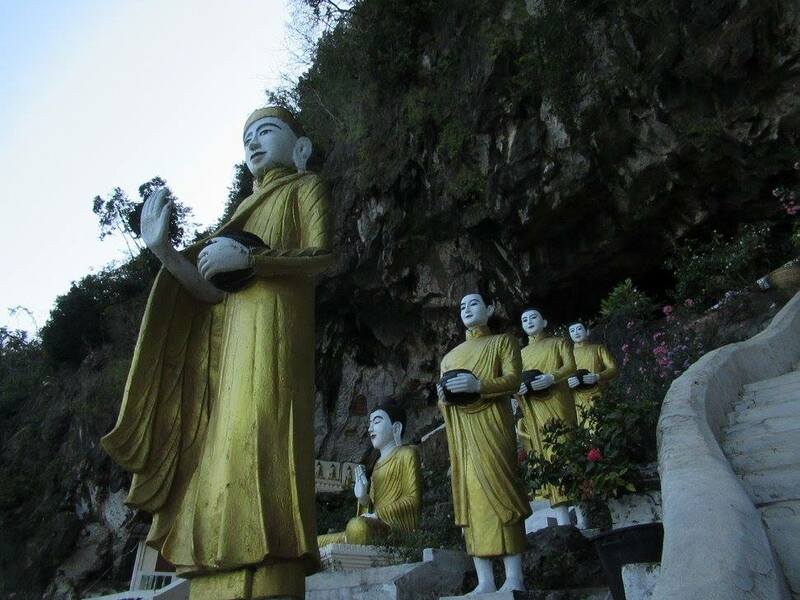 We’ve been to a mini temple on a mini stone, Kyauk Kalat Pagoda, enjoy the market around, saw a football game, and visit Yateak Pyan cave and temple before waiting for the sunset at the bat cave. Really worth to wait, enjoying the view on the river before waiting with the other tourists the show! We told us Kawgun cave wasn’t worth the entrance fee so we passed it. – Day 15: direction Thailand border! 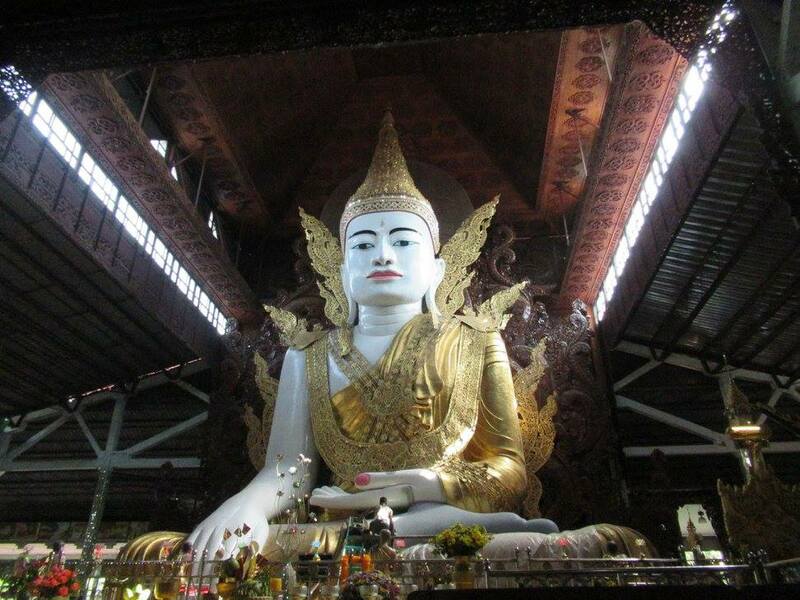 I really had a great time in Myanmar and totally recomend to go there, with more time than me! I think one month is perfect to have time and fully visit the sites and discover other places I couldn’t. I only regret I hadn’t many interactions with locals, as the only one talking english were working at agencies or hotels. Every landscape is awesome but I had a big crush on the south, close to the Thailand border.